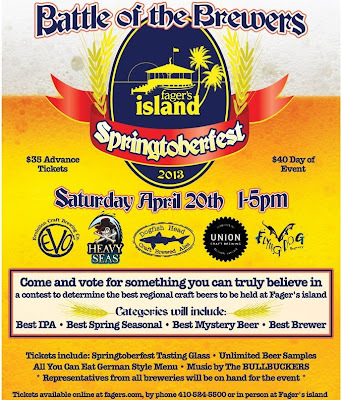 A contest to determine the best regional craft beers. Tickets include: Springtoberfest tasting glass. Unlimited craft beer samples. All you can eat German style menu. Today, as we are preparing to head up to the Time Warner Studio for our second appearance on NYC public access we are honored to find out that we received a high honor from a third international songwriting competition. Bullbuckers song, "St. Patties Day" Receives high honors as a finalist. The Great American Songwriting Contest had entries from 44 countries. * Judged by Robin Frederick — (Former Director of A&R for Rhino Records), Dennis R. Sinnott (director of EMI Music Publishing) Carla Starrett (Executive Director of SongLyricist.com), Brett Perkins (National Academy of Songwriters/ founder of Listening Room International Songwriter Retreats/ Copenhagen Songwriters Festival), Steve Cahill (Founder of Songwriters Resource Network), Pat & Pete Luboff (songwriters and authors) H.R. Cook (director of Weaver Of Words Music (an affiliate of Bug Music Publishing), Rob Wright (Radio host and talent scout/Former Sony Music A&R Department, the A&R Power summit and Urban Threshold TV), along with award winning songwriters. It's been quite a ride to date. Four years ago and a week we were born fittingly, at the Delaware Music Festival in early Spring. In our second year we put everything we had into releasing our debut CD. As a band hailing from the unassuming city of Wilmington Delaware, in our third year we submitted the CD to multiple international songwriting competitions. We thank everyone for your continued support of our work. It's our promise to build off of the honors we've received and focus on a future album this upcoming year.